Below are list of resources for inspiration and research. Please share anything that you think we should add! An Electromagnetic Walk is an installation with a series of everyday objects, each one connected to a headset and an electronic device manufactured using textile techniques, a fine copper mesh overlaps with the familiar objects creating antennas that can pick up electromagnetic waves present in our daily environment. Amplified and translated as such by the sound, these antennas give us access to a portion of the sound spectrum usually subtracted to the human ear. Throughout the exhibition, visitors are invited to use these strange artefacts, wearing or handling them, to walk in the space or in the street and to capture and collect the various sound sources. They will discover their electromagnetic surroundings, the ultimate dense soundscape of the electronic devices that surround us. “Rudy” is a protest jacket using a POV system to allow you sending a message thanks to the leds hidden into the badges. Tribute to the Skinhead‘s movement this jacket uses the symbols characteristic to this movement but this time using new technologies like numeric embroidery, 3D printing, electronic to re-create it and insert interactive system. During the mass arrival of the refugees in Germany in 2015, they asked themselves the question “what to do?” Their response was the development of clothes for a magical marching band (“Mag’s Magnificent Marching Band”) that encouraged walkers through recorded live music (drum beats for the time being) to welcome them. Conventionally electronics that are built from a kit-of-parts have been optimized for speed, efficiency and repeatability of assembly. While this approach demonstrates the power of modular systems that have made many of the technologies we rely on possible, it also constrains us to particular styles of building, influencing what we build as well as impacting how we come to think about electronics. A Kit-of-No-Parts demonstrates a new approach to building electronics that emphasizes the expressive qualities of diverse materials as well as the skill and creativity of the builder. I believe that a more insightful and skilled process is also capable of producing more intelligible and personal results. The aim of this workshop is to explore embroidery as a contemporary medium, in terms of both content and material. Participants will use conductive thread to embroider and “illuminate” personally meaningful sayings, slogans, phases and imagery. Embroidery is a historic craft that is used in many cultures, not only for decorative designs but also as a means of personal expression. More recently embroidery styles and cultures such as subversive cross-stitch, sublime stitching and radical cross-stitch are using embroidery as a medium for portraying more contemporary cultural and personal reflections. This example is about factors that lead to higher chances incarceration, but the technology can easily be translated to other concepts. This instructable is for people who are interested in experimenting with circuits to change thermochromic ink colors. The LilyPad Arduino is designed for e-textiles and wearables projects. It can be sewn to fabric and similarly mounted power supplies, sensors and actuators with conductive thread. Research into Lilypad as a tool to make physical computing more accessible to diverse communities is available here. Textile Messages created by Yasmin Kafai, Kylie Peppler, Leah Buechley, et al. 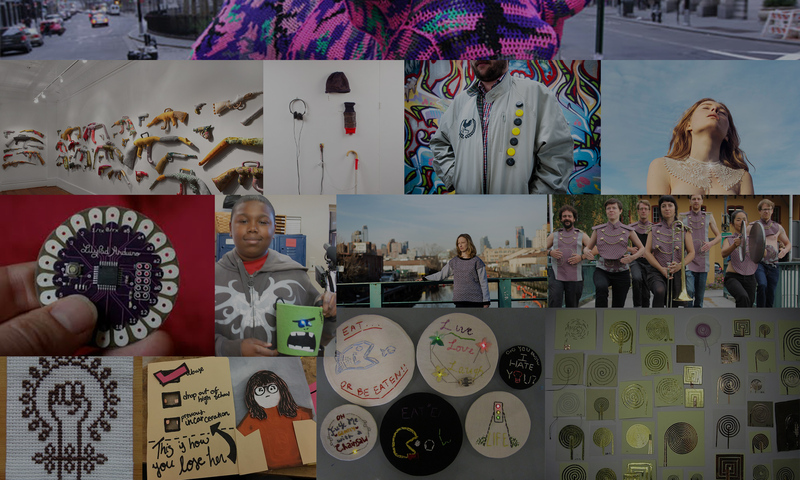 Documentation site to celebrate eTextiles in youth and education communities inspired by the book Textile Messages. The Knitted Radio is part of an ongoing investigation towards using traditional textile crafting techniques to create electronic components and devices from scratch. The overall investigation questions whether ‘what’ one makes is really more important than ‘how’ one makes things. The tactile piece manifests how to knit a sweater that is also a FM radio transmitter. By equipping the wearer with the ability to occupy electronic space, the casual knitwear intends to inspire local, free communication structures. The experiment is dedicated to the diverse crowd involved in recent Gezi Park protests in Taksim Square, Istanbul. Part of the Stitching Worlds research project.